NorthEndWaterfront.com reports a company that runs a Ferris wheel in Montreal wants to build a 200-foot-tall Ferris Wheel on Long Wharf - along with a liquor-serving cafe. Building new pilings for the Ferris wheel at the end of the wharf would, the company hopes, let it avoid the never-ending battle over whether any private concern could be built at the tip of the existing wharf. Boston Police report officers from the Harbor Patrol Unit rescued a man spotted in the cold water off Long Wharf around 5:20 p.m. yesterday. Read more. Redcoats arrive to restore order in the name of the king, huzzah! 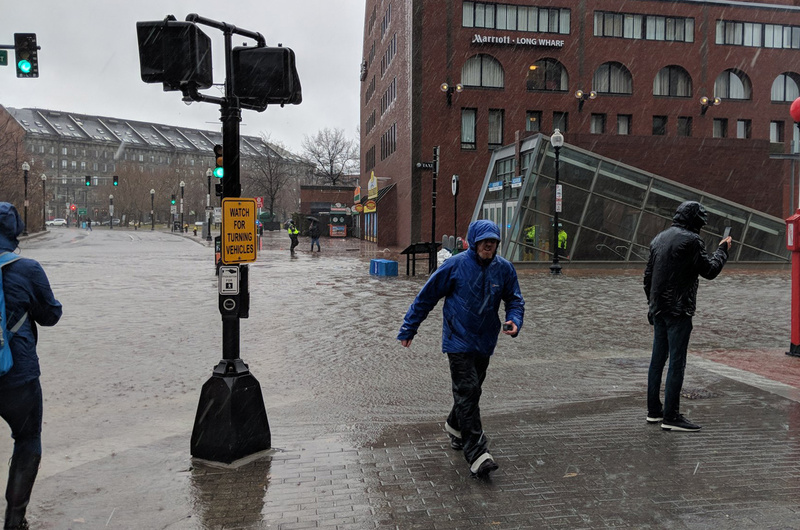 Shortly after 9 a.m., more than 100 of His Majesty's troops disembarked from rowboats and one sailing ship at Long Wharf to assert control over the increasingly agitated city of Boston - exactly 250 years after the same thing happened in colonial days. Read more. 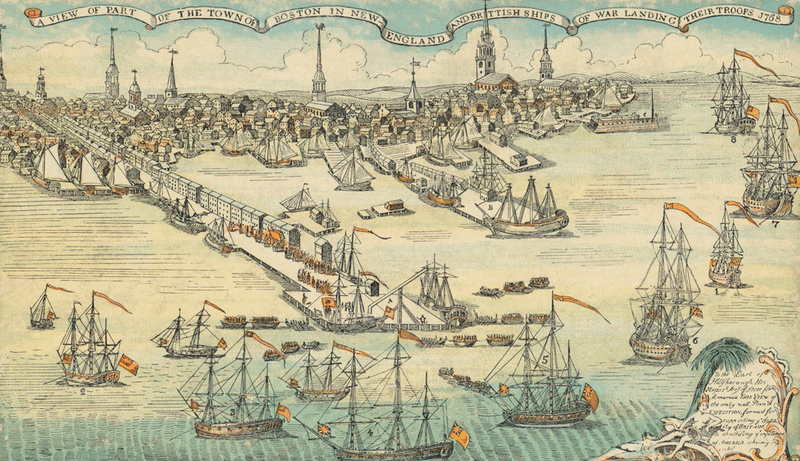 Soldiers disembarking on Long Wharf in 1768. See it larger. Some 250 years ago today, ships carrying British soldiers to a restive Boston moved into the inner harbor in preparation for landing. 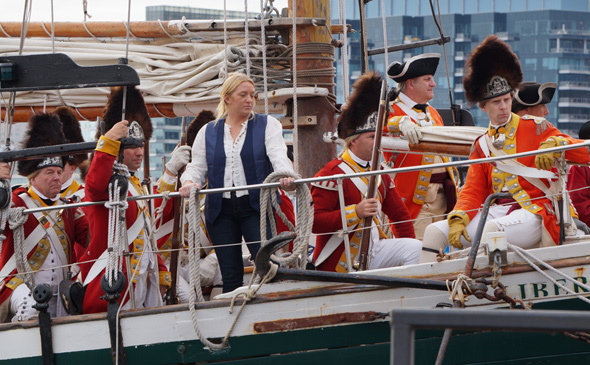 This coming Saturday, modern-day re-enactors will step off a boat at Long Wharf, march to Boston Common and begin the city's occupation all over again. Read more. Roving UHub photographer Noah Sachs was ambling along Long Wharf today when he spotted two unusual white items in the water: A great egret - and John Henry's $90-millon super-yacht, the Elysian: Read more. "Max, tell them to come out and don't B flat". Our own Cybah took in the pre-storm sunrise from Long Wharf this morning. He had some fellow early risers: Read more. They said yesterday the sun would come up tomorrow, and it did! Our own Cybah was on Long Wharf at the crack of dawn today. Read more. Christine Sullivan watched the sun come up over Long Wharf and Boston Harbor. S&S Consulting walked along an "ever so ghostly and melancholy" Long Wharf in the fog tonight. The day started in a fog as well. Hood Will Hunting watched the sun come up from Long Wharf this morning. The Supreme Judicial Court ruled today that cities that want to tear down parks to put up schools or other buildings have to first get the approval of the state legislature. A significant piece of the ruling consists of the justices considering how the situation in Westfield - where a school was proposed to replace a playground - differed from that of Boston's Long Wharf, where the BRA/BPDA wants to convert a large open-air shelter currently open to the public into a restaurant. Read more. Mitchell watched "a brave man execute a pretty nice dive" into Boston Harbor from the end of Long Wharf early this evening. Guy diving into the harbor during a king tide. 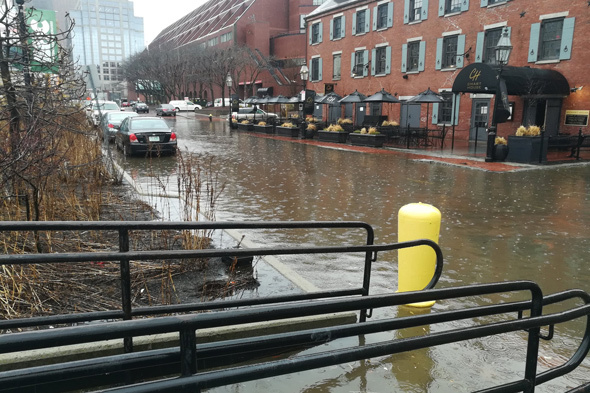 The BRA, um, BPDA, just won't take no for an answer: After losing several legal battles over its attempts to put a restaurant at the end of Long Wharf, the authority is trying yet again to convince judges to let it get what it wants. Read more. Keith J. Finks reports he set out to make a Tom Brady snowman at the end of Long Wharf this afternoon. Failed completely, realized it looked more like a fox... meet Foxy Tom!!! 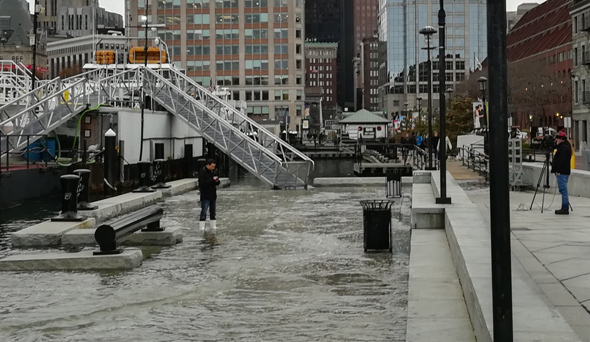 Mark Novak shows us the morning king tide at Long Wharf. Read more.